Yesterday must have been devastating. I’m sure it went something like this: You, the avid and enthusiastic diehard follower of this blog, wake up. It’s Thursday! Your favorite day! Why? Because there’s always a new post on Thursday! You open your computer, ignoring the shouting coming from your loved ones to pay attention to them, and automatically go right to this very blog. You’re so excited to see what I made and read my witty, concise and grammatically correct banter. There is nothing. You spiral down into a deep dark place that no one can shake you out of. You can’t be reasoned with because there is no reason left in the world. Everything is over. That’s how I imagined it playing out in my head, and I’ll confess I was wracked with a touch of guilt. If it’s any consolation, I was however-many-thousand of feet in the air on my way to New York. Now I’m a bi-coastal blogger! How exciting. Well here is your long awaited blog post. Simple yet super satisfying for those crisp autumn mornings. 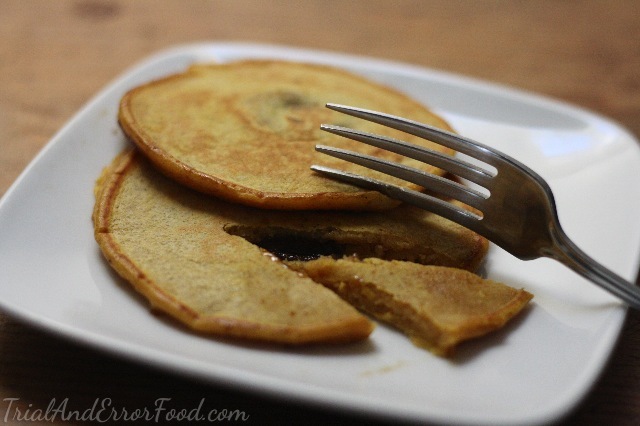 Stuffed Pumpkin Pancakes. Ready?? Here’s what y’all need!!! 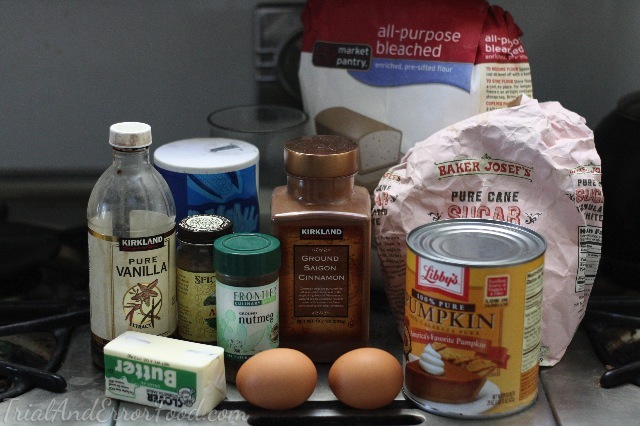 Vanilla extract, allspice, nutmeg, cinnamon, sugar, AP flour, butter, eggs, milk, baking powder (not pictured, y’all should be used to this by now) and canned pumpkin. Make sure it’s pure pumpkin and not pumpkin pie mix or whatever that stuff is. Also a note on this recipe: it was definitely a trial run. I would change up a few things next time. 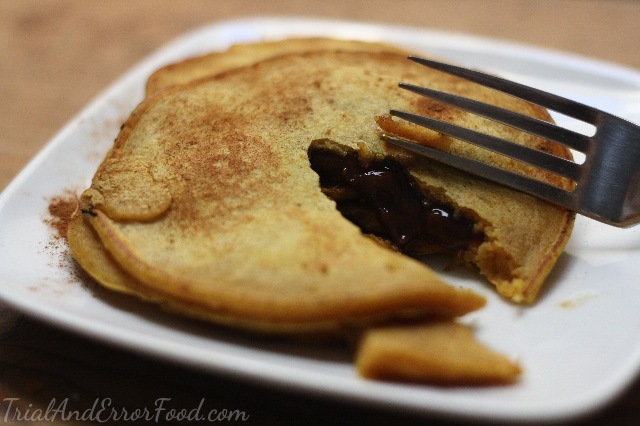 The pancake recipe itself is delicious. 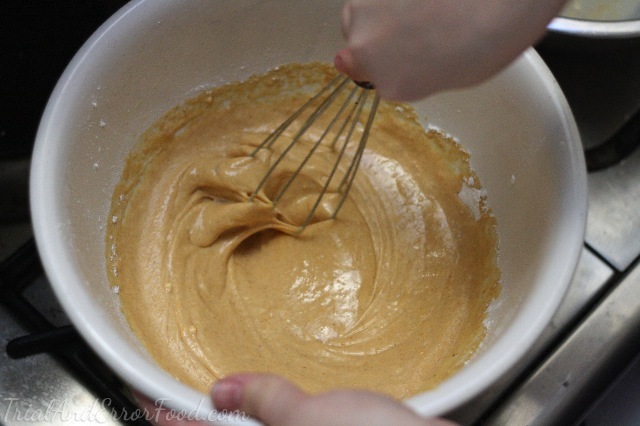 I tried making a brown sugar- butter melty mix that I wanted to swirl in, but the consistency was weird. I finally got it to a pretty good liquid, but it needed constant attention and would harden pretty quickly- so instead of messing around with that I would actually recommend busting out that caramel sauce we made a couple weeks ago and putting it to good use yet again. I’ll show you where exactly you should do that in a bit. 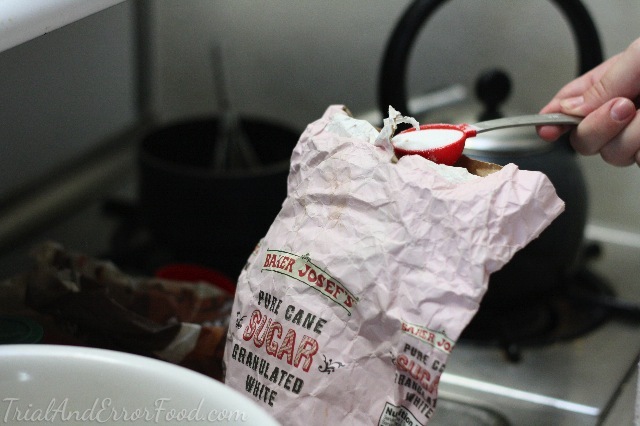 First, let’s get our flour on. I’ll give rough estimates of spice measurements, but honestly I just eyeball it and decide how much I want. I recommend that method. In a separate bowl! Add your pure pumpkin to the milk. 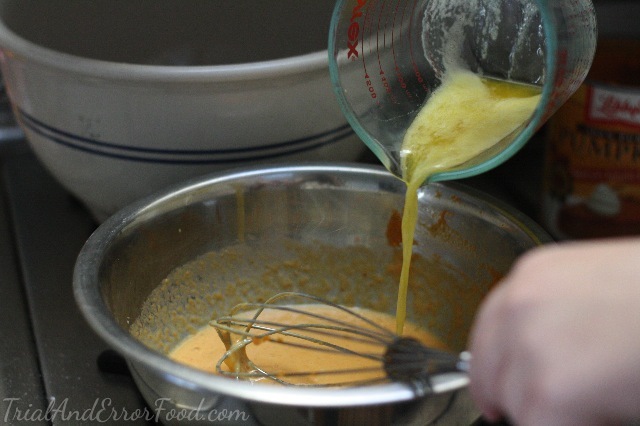 Drop in your eggs and whisk away!!! Add in melted butter. This is officially the best step of any recipe ever. Add in a dash of vanilla and you’re almost there! 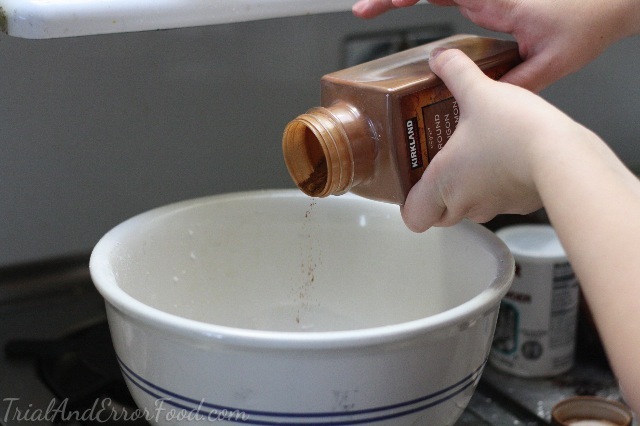 Pour pumpkin liquid-y goodness into flour and combine. 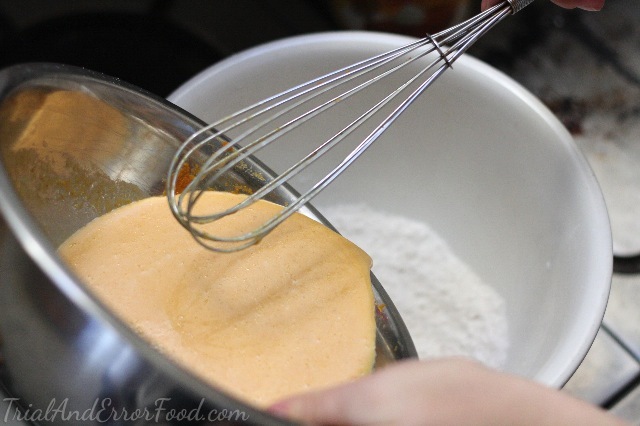 At this point it was clear the batter was too thin- if your batter is too thin, just slowly add more flour little by little until you reach a thicker consistency. Butter up yer pan and get it hot! THIS is where you’d bust out your caramel sauce. Kat and I tried to swirl in the butter-sugar mix, but we weren’t digging it, so since Kat’s a genius, she suggested layering in the mix so there was a gooey center. YEAH Kat!!! It was SO good!!! So here’s what you do. 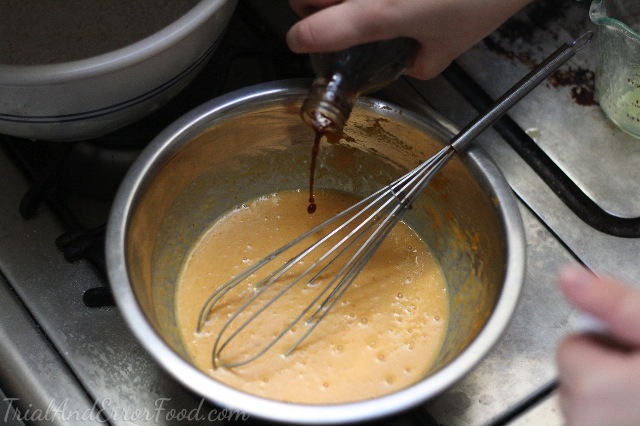 Fill a 1/4 measuring cup about halfway full with batter, then spoon in a blob of the caramel sauce and then ladle on the other half of the batter. 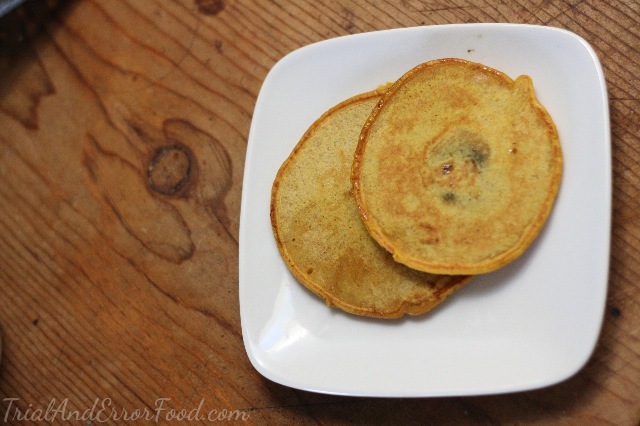 Drop in the batter to a hot pan! It works surprisingly well. You’d think the gooey center would go everywhere but it stays nicely tucked in the center. Wait for the little air bubbles to burst and then flip. Cook until golden brown. A little starts to peak out and thennnnn…! Whooaaaaa Nelly. There’s the good stuff right there. Give it a try! Tell me what you think! Also I highly recommend gett’n yer creativity on and trying out different delicious filling ideas. Let me know how it goes and happy eating! 1. 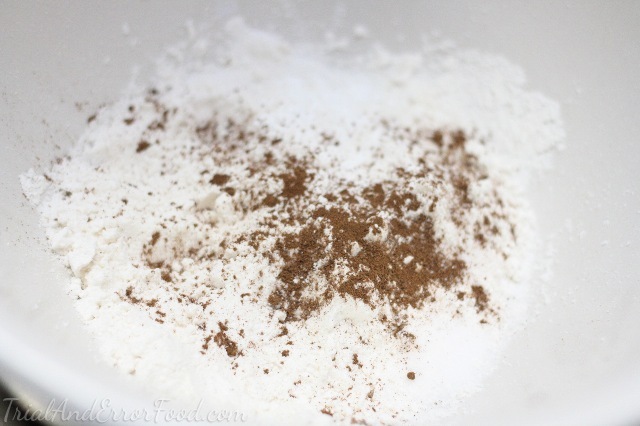 Combine flour, baking soda, sugar, salt and spices in a large bowl. 2. 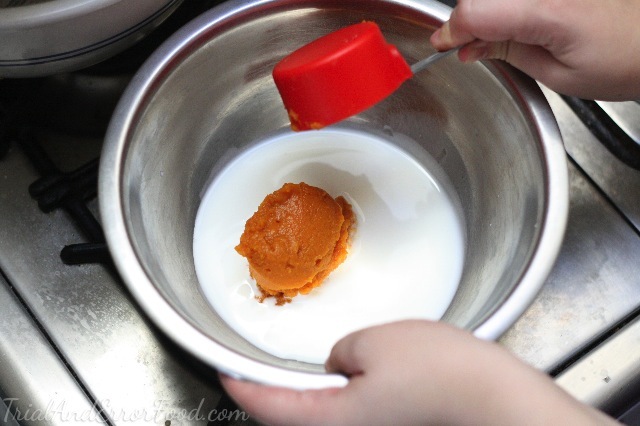 In a separate bowl, add pumpkin to milk. 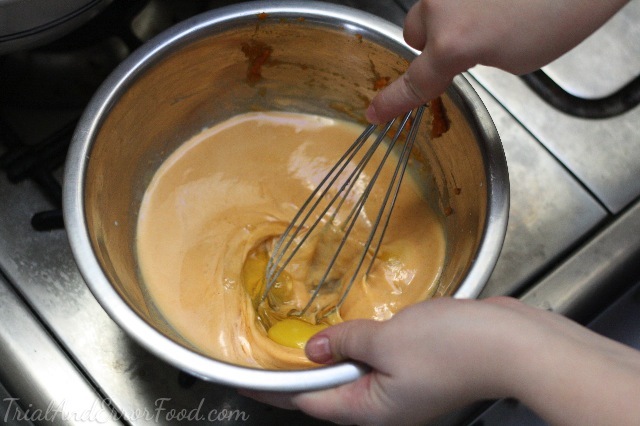 Whisk together and add in eggs and vanilla. 3. 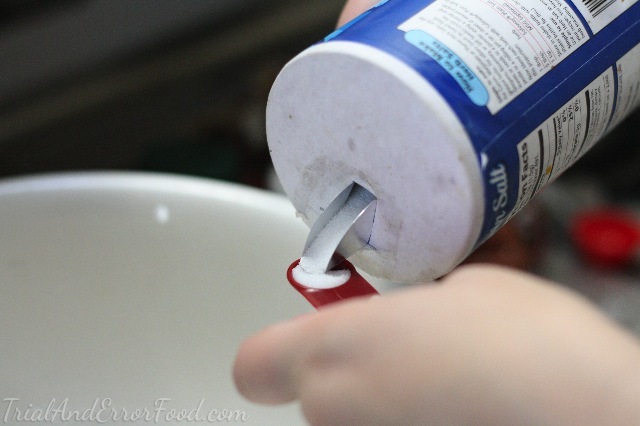 Add liquid ingredients to the dry and combine. 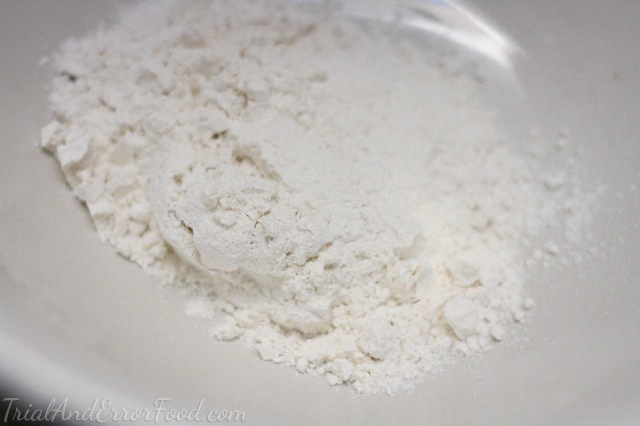 Add in extra flour if batter is too thin. 4. Butter up a trusty skillet and let heat on the stove over medium. 5. 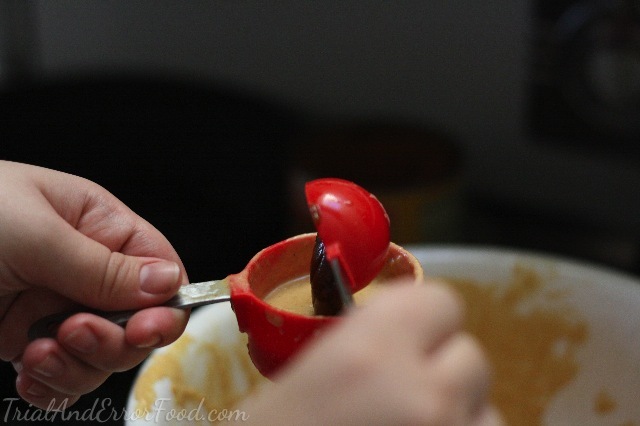 Fill a 1/4 measuring cup half full with pumpkin batter. 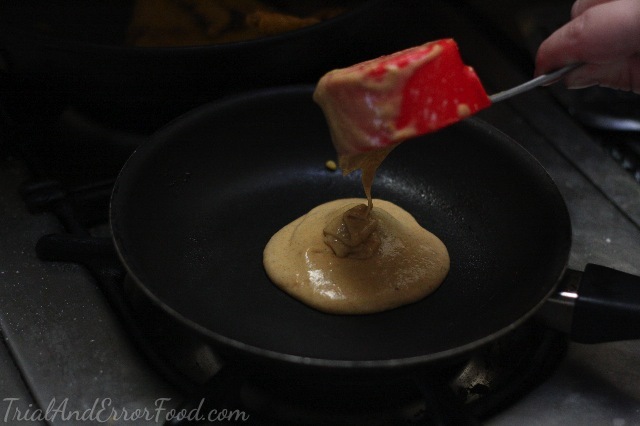 Add a large spoonful of caramel sauce and ladle in the other half of batter to cover the caramel. 6. 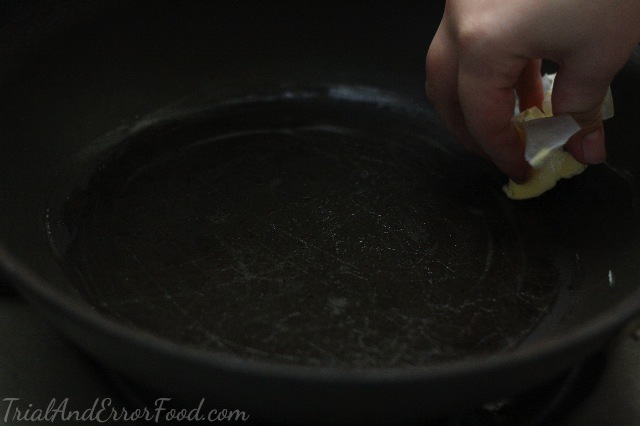 In a heated pan, drop in the batter and wait until all of the air bubbles have burst and flip until fully cooked. 7. Enjoy! I enjoy them as they are with a light dusting of cinnamon.